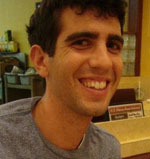 Meet Daniel Rabin, Rosh Bogrim 2012! We are very excited to announce our 2012 hanhallah (Senior Staff)! Keep checking the blog this week for more information! Shalom! My name is Daniel Rabin and I am so excited that I am going to be returning for my second year as Rosh Bogrim this summer!! I am a senior at the University of Maryland majoring in chemistry. Ramah has always been a part of my life. I was a camper at Camp Ramah in California for three summers and this will be my third summer working at Camp Ramah in New England. In my free time I love singing with my a cappella group and playing basketball. I am so excited for this summer, I can't wait to see you all!